I talk to a lot of leaders who say they want to communicate effectively, but they’re not sure how to. They have questions about how to overcome communication challenges, how to share tough news with employees, and how to measure the effectiveness of their communication. I thought I’d answer the top six questions I get from leaders about communication. 1. If communication is so critical to leadership and business, why isn’t there enough communication in business today? Communication is often seen as an "add-on" to "hard" or "technical" business skills. Communication is often perceived as someone else’s job. Sometimes leaders spend their time and resources focusing on goals that directly contribute to the bottom line, not knowing that communication does too. And there are a myriad of myths about communication that get in the way, myths such as "talking is communication" or "people won’t interpret situations or give them meaning if leaders don’t talk about them," both of which are far from the truth. #Leaders create engagement by focusing on productivity, creating morale and building relationships. 2. 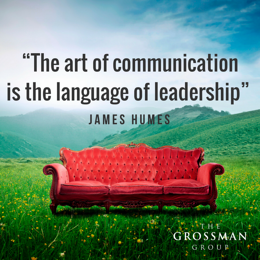 Why do leaders need to be effective communicators? Today’s leaders need to be effective leadercommunicators and use strategic communication as a way to achieve the business goals they seek. Leading is communicating; you can’t separate communication from leadership. Without communication, employees lack direction and can’t measure their performance. They lack an ability to see themselves and their work as part of the bigger picture. They can’t add value by contributing as a thinking member of the team. And what’s most important is that you can’t lead if you can’t express yourself. Your technical skills and abilities can take you only so far. Leadership is much more. It’s about getting things done and moving a business forward through other people. Feel like you're communicating but your employees don't always hear you? Our free ebook can help. Employees are eager for a leader who can step up and guide them with strategy and integrity. Click here to access messaging secrets on how to connect and communicate with your team. Asking questions and listening are critical. Leaders create engagement by focusing on productivity, creating morale and building relationships. Before you can understand a business problem or achieve a goal, you have to understand what the situation is. Asking questions is the best way to come at a problem from varied perspectives. If a leader problem solves from assumptions or only the information at hand, he or she won’t be effective. 4. What’s the greatest communication challenge for leaders? The greatest challenge leaders face is failing to remember that everything they do communicates. Whether they intend to or not, everything leaders do (and don’t do) communicates something, so why not communicate well? It’s no secret that people will read into your behavior. They interpret situations and give them meaning, whether or not you communicate about it. Communication provides the right information and prevents misinformation. Leaders need to remember that they make the weather every day for their people. 5. How can leaders measure the effectiveness of their communication? You can ask others. You can listen (and then listen some more). You can also use a 360 to assess how you’re actually communicating, as compared to how you may think you’re doing. We all have blind spots, and most of us tend to overestimate our skills. Leaders who are extroverted typically say and do a lot, but the quality of their communication suffers. On the other hand, introverts tend to think they’re communicating more than they actually are. Effective leadercommunicators practice just like great athletes. Look at Serena Williams. She’s one of the best tennis players in the world, but she still practices every day. Leaders don’t have to be perfect, but we all need to work on flexing our leadership muscle so it gets stronger over time. A great place to start is to listen to see how you’re doing in meeting your team’s needs: listen to the questions people ask, and look in the mirror and check your reflection. 6. How can leaders inspire their employees when they don’t have good news to share? The test of great leadership is to ensure understanding in the tough times as well as in the good times. The best leadercommunicators communicate even more in challenging times. They place greater emphasis on two-way dialogue and face-to-face (or at least voice-to-voice) communication, and they’re visible. They listen more than they talk. They ask questions. They’re genuine, honest, and empathetic. Be assured, too, that as a leader, it’s OK to not have all the answers. The three best credibility-building words a leader can say are, "I don’t know" (and then go out and find the answer). How can these answers help your leadercommunicator skills? Learn how to communicate in a way that resonates. Download our Can You Hear Me Now? ebook today!